Mercedes-Benz is celebrating the 30th anniversary of the w124, the car that became the very first E-Class. Initially introduced as a sedan, the 124 series was presented to members of the media at an event held in November of 1984. The press release distributed at the launch of the w124 indicates that Mercedes ordered its research and development department to start designing a replacement for the w123 in July of 1977. In 1978, Mercedes executives decided that w124 production would start in 1984, and the project’s basic guidelines were laid out and finalized in April of 1979. The idea was simple: Engineers and designers were asked to improve the concept of the w123 without drastically deviating from it. As a result, the w124 is marginally longer, narrower and shorter than the w123 with a slightly longer wheelbase and a more spacious trunk. Visually, the w124 broke almost all ties with the outgoing w123 and instead adopted a boxy, squared-off design that borrowed styling cues from the w201 190 that was introduced in 1982. The design was penned by by Joseph Gallitzendörfer and Peter Pfeiffer under the guidance of Bruno Sacco, the head of Mercedes’ design department at the time. Like the Citroën BX, the w124 was exceptionally aerodynamic in spite of its angular design, registering a drag coefficient of either 0.30 or 0.29 depending on the model. At launch, the European w124 lineup consisted of three diesel-burning models dubbed 200D, 250D and 300D, respectively, and four gas-powered variants called 200, 230E, 260E and 300E. A 200E was offered exclusively in Italy, where cars with an engine displacement of over 2.0-liters were subject to stiff taxes. At the time Mercedes’ naming system was fairly straight-forward, meaning that the 300D used a 3.0-liter diesel, the 200 was powered by a carbureted 2.0-liter and the 260E packed a fuel-injected 2.6-liter. The lineup grew at the 1985 edition of the Frankfurt Motor Show when Mercedes presented the s124, its second factory-built wagon. Like the s123 that it was designed to replace, the s124 was essentially identical to its four-door counterpart from the tip of the front bumper to the B-pillar. Beyond that, it boasted a spacious rear end that could be fitted with an optional set of rear-facing jump seats, allowing a family of seven to comfortably go on vacation. The second big news announced at the 1985 Frankfurt show was the introduction of an all-wheel drive system called 4Matic. 4Matic was exclusively offered on w124 and s124 models equipped with a six-cylinder engine. A coupe was added to the lineup at the 1987 Geneva Motor Show. The coupe looked markedly sportier than the sedan thanks to a lower roofline and a wheelbase that had been shortened by 3.3 inches (about 8.5 centimeters). Both four- and six-cylinder variants of the Coupe were offered but, unlike its predecessor, it was never available with a diesel engine. Mercedes gave the 124 lineup a slight facelift in 1989 that largely consisted of a redesigned interior and the addition of protective cladding – sometimes called “Sacco boards” – on the bottom of the doors. A long-wheelbase six-door model designed jointly with Germany’s Binz was presented that same year. Stretching 31 inches (80 centimeters) longer than a standard four-door w124, the six-door model was initially available as either a 250D or a 260E. The most powerful w124 to date was presented in October of 1990 at the Paris Motor Show. Called 500E, it used a 326-horsepower evolution of the 5.0-liter V8 that powered the r129 500SL. The eight-cylinder propelled the w124 from zero to 62 mph (100 km/h) in 5.9 seconds and on to a top speed that was electronically limited to 155 mph (250 km/h). The 500E perfectly embodied the proverbial wolf in sheep’s clothing and the biggest visual modifications between it and a stock w124 were flared fenders, 16-inch alloy wheels, a lowered suspension and fog lights. Determined to have a presence in all market segments, Mercedes introduced a 124 convertible in 1991. The ragtop was based on the existing coupe but about 1,000 parts had to be redesigned and 286 pounds (130 kilos) of sheetmetal were added to make up for the loss of structural rigidity. Like the r129 SL, the 124 convertible was equipped with a sensor-controlled automatic roll bar that deployed in 0.3 seconds if it detected a rollover was imminent. The entire 124 range was given another facelift in June of 1993 that brought a revised front fascia inspired by the w202 C-Class, a couple of new engines and a new name. 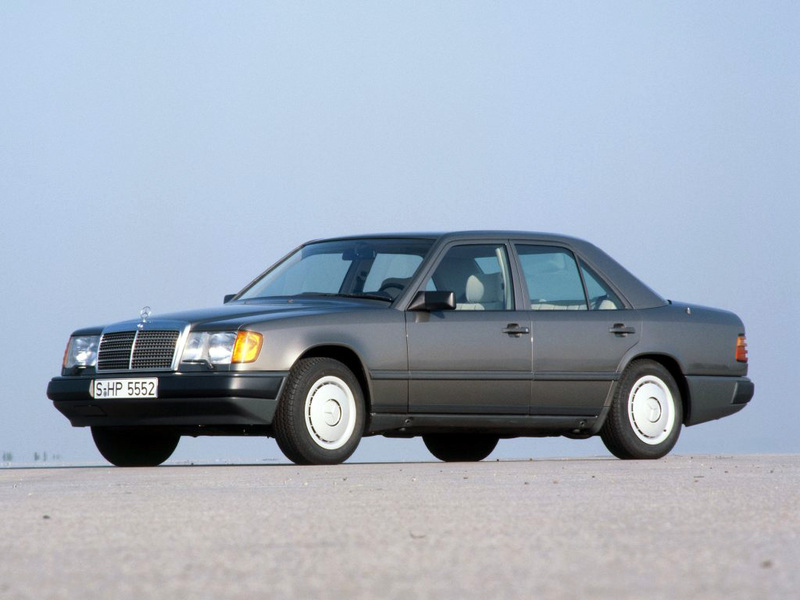 From that point on, the 124 was called E-Class and the whole lineup was given a new moniker that started with a E. For example, the 300E became the E320 and the 400E became the E420. The letters that were commonly used in Mercedes’ previous naming system were relegated to the history books. E was no longer needed because Mercedes stopped offering carbureted engines, C and T were dropped because they were self-evident and D was simply written out as DIESEL on the trunk lid. The 300D was christened the E300 DIESEL. For performance aficionados, the most important update that came in 1993 was the addition of a new range-topping model called E60 AMG. Nicknamed Hammer, it was powered by a 6.0-liter V8 engine that made 381 horsepower at 5,600 rpms. Buyers looking for a more affordable way to go fast in a w124 could order the E36 AMG, which was equipped with a 272-horsepower straight-six. With the w210 ready to take over, Mercedes stopped building the w124 in August of 1995, though the E250 Diesel and the E220 were built and packed in complete knock-down (CKD) kits that were shipped to overseas markets for about another year. The station wagon carried on until 1996 and the last convertible was assembled in 1997. All told, Mercedes built 2,213,167 124 sedans, 340,503 124 wagons, 141,498 124 coupes, 33,952 124 convertibles, 2342 long-wheelbase sedans and 6,398 chassis with semi-bodies for special conversions such as ambulances and hearses. A total of 2,737,860 124s were built, 40,000 more than the 123. Most photos courtesy of Mercedes’ archives department. Tags: Mercedes, Mercedes-Benz, Mercedes-Benz 300D, Mercedes-Benz 300E, w124. Bookmark the permalink. Nice article, thanks for posting it! Glad you enjoyed it. I had a 300E a few years ago, it still sticks out as one of the best cars I’ve ever owned. Great article. I actually reviewed an ’86 300E (http://rnrautoblog.com/2014/08/04/1990-mercedes-300e-2-6-review/), and I was blown away. No doubt about it, the W124 is probably one of the greatest Mercedes-Benz ever made. i had a 300awd which was a great car lacking only a manual transmission. The auto wasn’t to bad in the 300E, at least it didn’t bother me. The 300E is great with a manual but they’re hard to find (and exclusively RWD). This car is just on its own class. I have one and I love it. It’s reliable. I had a ’92 300E — it still stands out as the best car I’ve ever owned.